Food is scarce during South Sudan’s dry season when the land turns brown, dusty, and desolate. Residents and thousands of refugees become more vulnerable to starvation and sickness. Samaritan’s Purse oversees monthly food distributions for refugees and local communities in partnership with the World Food Programme. More than 400,000 people throughout the country receive basic food items including sorghum, cooking oil, peas, and salt. These rations can feed a refugee family for up to one month. Through our partnership with World Food Programme, more than 400,000 people throughout South Sudan receive basic food items. 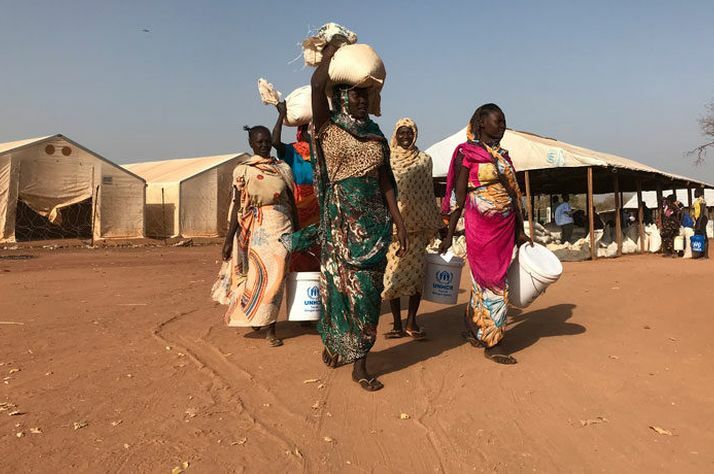 In Ruweng State in northern South Sudan, Samaritan’s Purse has long-served the refugee community—now totaling over 166,000—from Nuba Mountains. In Ajuong Thok refugee camp alone we distribute food monthly to more than 37,000 refugees. Samaritan’s Purse operates projects from five primary field bases in South Sudan. In addition to food security and livelihoods projects our teams also focus on water and sanitation, healthcare, nutrition, and continuing partnerships with local churches. Please pray for the people of South Sudan and for our teams serving in Jesus’ Name.